Epiroc introduces another first in hydraulic breaker technology. 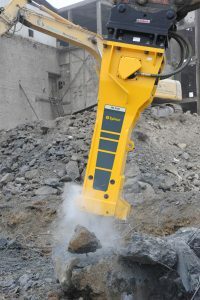 Many of the company’s heavy hydraulic breaker attachments now feature the patented Intelligent Protection System (IPS). Seamlessly combining Epiroc’s AutoControl and StartSelect functions, the fully automated system provides simpler, more efficient, and more economical breaker operation. IPS makes the breaking process even simpler for the operator by automatically adapting the breaker’s operating behavior to any working condition. Uptime is increased because, with its fully automated functionality, IPS requires no operator intervention or reaction — and thus no work interruption. Epiroc HB 2000, HB 2500, HB 3100, HB 3600, HB 4100 and HB 4700 are equipped with IPS. During 2018 all other heavy hydraulic breakers in the Epiroc range will incorporate the unique system. Epiroc is a subsidiary of the Atlas Copco Group that is planned to be listed on the stock exchange in 2018. Atlas Copco announced in January 2017 that the Group will split into two companies in 2018: Atlas Copco, focusing on industrial customers, and Epiroc, focusing on mining, infrastructure and natural resources customers. The split is proceeding according to plan, but remains subject to approval by Atlas Copco shareholders in April 2018. For more information, visit www.epiroc.com.